Since Mahaprabhu instructs that we should chant the holy name in a humble state of mind, in this newsletter we discuss humility – specifically how humility is our natural position. I also thought it necessary to look at the relationship between humility and self esteem, as the qualities of the humble soul are often mistaken to be symptomatic of one having low self esteem or a lack of self confidence. Finally, we take a look at what is our real value. In order to deal with these four subjects, I have divided the article into four sections. PS If you don’t have time to read the entire article now, just go to Part Four and read the quote from Srila Prabhupada. It’s powerful. It is said that humility is reality. That’s because seeing what’s real about ourselves makes us humble. And what is real is that we are tiny (and we aren’t going to get any bigger). Aside from being a fraction the size of a hair, we are one among uncountable numbers of living entities who live on one of the uncountable numbers of planets in just one of uncountable numbers of universes. So big shot, how does that make you feel? In addition, we can’t stop natural disasters, we can’t stop time – we can’t stop so many things. Let’s add to the equation the fact that the power, ability and intelligence we do have is borrowed from Krsna – and He can take it away at any time. If all this doesn’t make us feel a bit humble, we need to turn the lights up. As we see more of reality, we’ll see more things that should humble us. So why don’t we keep the lights on all the time, or why do we turn them on but keep them dim? It’s because the false ego doesn’t like humility. It likes glory, acknowledgement, and honor. Therefore it needs darkness to stay alive. In fact, it relishes it. Could you imagine relishing taking a bath in donkey urine? The acaryas describe seeking honor to be just that. You’ve got to admit that it takes a lot of darkness to think a bath in donkey urine is enjoyable. I guess we’ve been in bed with darkness for so long that the light hurts our eyes. The problem is that seeking honor is the main enemy of bhakti. So it’s not something we should take lightly. But can we become humble simply by understanding that pride is destructive? This article probably won’t instantly make you more humble than a blade of grass. But it can inspire you to make a greater effort to deal with the enemy of pride. My hope is that you acknowledge you can choose to act humbly no matter how much your ego flares up – and that you become motivated to make that choice. The problem is that if humility is not attractive to you, there will be little impetus to cultivate it. Thus, there will be little desire to deal with the false ego when it allures you to seek recognition. So having a distaste for pride and a taste for humility is fundamental. How can we cultivate this desire? It starts by examining pride more closely. If you do you will find it really is unattractive. Even Krsna is not attracted to his devotees when they are proud. Pride even makes you unattractive to yourself. After all, don’t you feel kind of yucky when you are always looking to be recognized (at least it leaves everyone around you feeling that way)? Humility is quite different. It’s your natural position and therefore when you are in your natural position you feel comfortable, satisfied and happy. So, if you look upon humility as something attractive, it will naturally increase your desire to be humble. And this will give you the impetus you need to deal with your false ego when it flares up. And there is a big side benefit to doing this: you will attract Krsna. That’s because humility is so attractive to Krsna that it melts His heart. But how attractive can you be to Krsna, to yourself, or to anyone else, if you daily bath in donkey urine? To read more newsletters on Humilty click here, click here, and click here. Humility doesn’t mean a lack of self confidence. For devotees, self confidence is to be bold and daring in Krsna’s service with full dependence on Him, humbly accepting that he or she has nothing of value to offer Krsna and can do nothing without the mercy, guidance and blessings of guru and Krsna. A devotee acts with the understanding that by their mercy a lame man can cross mountains, a dumb man can recite poetry and a blind man can see stars in the sky. Srila Prabhupada was extremely humble. At the same time he was confident that by the mercy of his guru maharaja he could be an instrument for spreading Krsna consciousness all over the world. Although he often said he had no qualification to spread the Krsna consciousness movement, he never hesitated to boldly preach and make plans to take Krsna consciousness to every nook and corner of the planet, fully confident that someday the Krsna consciousness movement would go down in history for saving the world. Secular psychology “psyches” us up by telling us to think “I can do it.” Spiritual philosophy motivates us in a different way. We can also think “I can do it,” but the reason we think this way is because we know Krsna will help us do the impossible. Prabhupada always said that if we are sincere Krsna will help us advance in Krsna consciousness and advance in our service. So “I can do it” really means “He can do it” and He can use me to do it. This is spiritual self confidence. I have often noticed in India that when someone does something great and is asked how they did it, they usually say something like, “His mercy” or point up to the sky and say “Bhagavan.” No doubt they had to work hard, overcome obstacles, and remain fixed and determined to achieve their success. Yet they give all credit to God. They know that without His blessings all the hard work and perseverance in the world will not bring success. The place of action [the body], the performer, the various senses, the many different kinds of endeavor, and ultimately the Supersoul (italics mine)—these are the five factors of action. For each and every action there is a different endeavor. But all one’s activities depend on the will of the Supersoul, who is seated within the heart as a friend. The Supreme Lord is the super-cause…… Everything is dependent on the supreme will, the Supersoul, the Supreme Personality of Godhead. So go for it. Utilize whatever resources are required to become successful. But always remember that “you can do it” by His mercy. But what about self worth? A lack of self esteem entails feeling unworthy and unlovable – possibly even useless. And we find prayers in which great devotees express these emotions. We even find instructions telling us we should feel this way. But don’t such feelings lead to depression and a lack of energy and enthusiasm? Devoid of bhakti they easily can. A devotee feels unworthy of Krsna’s service, even unworthy of being called a devotee. That is his humility. But a devotee never feels that Krsna doesn’t love him. In fact, Krsna cannot stop Himself from loving us. We are his children so we are natural objects of His affection. It’s the nature of bhakti that the more there is a negative feeling, the more it increases the desire to be Krsna conscious. It’s like hunger. The more you have it, the more you want to eat. So feeling unworthy or unqualified to be a devotee, or feeling very fallen and distant from Krsna, actually increases a devotee’s appetite for Krsna. This is how we enter Goloka Vrndavana. The negative creates the hankering for the positive. The sastras says this hankering, called laulyam, is the only way to get Krsna conscious. We don’t negotiate our way to Goloka based on our qualifications. The nature of bhakti is that it shines light on our real position. That is why advanced devotees think they have no love of Krsna and neophytes often think they are advanced. Humility, as mentioned before, is acknowledging our real position. So when a devotee expresses his fallen and lowly condition, he is only expressing the reality. So the reality of being lowly isn’t something bad. It’s just what is. Yet, the tiny and lowly soul is full of bliss. So materially it’s difficult to understand how one could simultaneously feel lowly and blissful. But that’s our position. It’s the bliss of being insignificant. Hey prabhu, it’s blissful down here. Part Three – What is Success? I also want to talk about success because we often analyze our self worth in relation to our “success.” Society tends to define success for us, and define it in ways that are often unnatural, unachievable or undesirable for us. This can make us feel that if we don’t achieve the things successful people have we are unsuccessful. In turn, this can motivate us to achieve what we really don’t want in order to feel successful. And if we are unable to achieve those things, we can feel we are a failure. The reality is that different people are able to achieve different kinds of success in different ways. For many of us, the success we achieve is not going to rate as success by society’s standards. I remember a story Prabhupada told about an elderly woman who lived in Vrndavana. 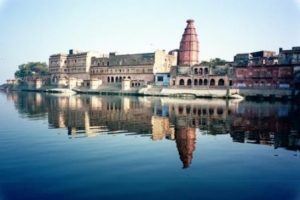 Daily she would go to the Yamuna early in the morning to fetch water for the Deities. She did this without fail throughout the cold Vrndavana winters and scorching summers. Prabhupada noted the devotion of this woman and said that when she died she went back to Godhead. Although she probably went unnoticed because she wasn’t a “successful” person, she was truly successful. We each have a role to play in the Lord’s service. Not all of us will be empowered leaders or preachers saving large numbers of souls. Not all of us will be able to do “big” service or be “big” devotees. What’s important is that we take stock of what talents Krsna has given us and use them to the best of our ability to do our humble little part in His service. This is success. This success may not end up changing the world, but it will please Krsna – and it may likely change the lives of some. Do the best you can, with the abilities and resources available to you, and with all the bhakti you can muster up – and you are successful. Humbly acknowledge that there will always be someone “more successful” than you, someone who can do more things than you or do things better than you. In any case, no ones so called greatness impresses Krsna. Our sincere attempt is what pleases Him. What really is “great” is the bhakti we give to Krsna. To read another article on the meaning of success, click here. We can’t impress Krsna with our things, with our so called qualifications (although we might try to impress others with them).